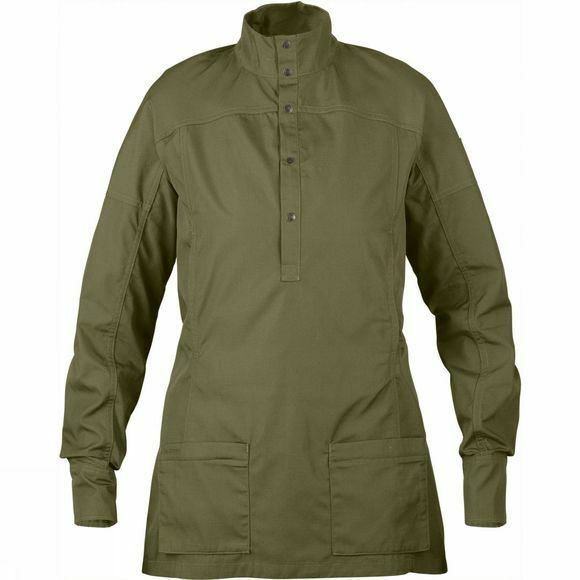 The Womens Abisko Shade Tunic is light and comfortable for trekking and outdoor life in warm, sunny climates. It's constructed with Fjällräven's G–1000 Air that has excellent ventilation so you keep as cool and dry as possible. Built–in UV protection makes it as easy to wear when trekking as it is in urban environments – by itself or with a tank–top or t–shirt underneath. The cut is feminine and well–fitting with an adjustable elastic band at the back of the waist. The collar is high to protect the neck from the sun, and the front opening is half–length with press buttons. There are two hand pockets, positioned high for the best comfort, and a pair of zipped bellows pockets lower down. In addition, there is a hidden security pocket with a zipper at the back. The sleeves are long, but can be rolled up and held in place with buttons.